Introverts work best at home, far away from people. It’s not that introverts necessarily hate people. In fact, there are a lot of reasons introverts work best at home that have nothing to do with other people. Comfort is key to finding satisfaction throughout your career. You will do your best when you are comfortable in your own skin, which isn't likely to happen if you’re not comfortable with your environment. The most important reason an introvert works best at home is that they are comfortable in that environment. You will get the best results from someone who is comfortable, rather than someone who is anxious or stressed. Some people work well under pressure, while a quiet introvert may succumb to a stressful environment. If it's one thing introverts don’t like, it’s confrontation. Even if it's via email from your boss, confrontation of any kind is an automatic anxiety-provoking trigger, which introverts strive to avoid at all costs. This fear is what makes them so dependable. 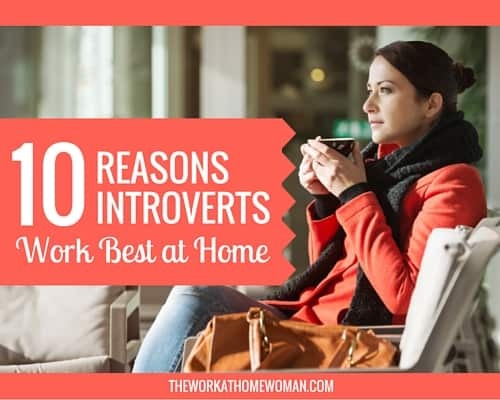 You don’t have to worry about an introvert not accomplishing their daily tasks while they work at home for many reasons. One of the most obvious reasons is because they don’t want to be contacted anymore than they already have to be, especially if it's in a negative connotation. One thing that is despised by introverts is senseless chatter. From quick “hi's and bye’s” to awkward chitchat about your co-worker's personal life, working outside of the home can create a brain overload. 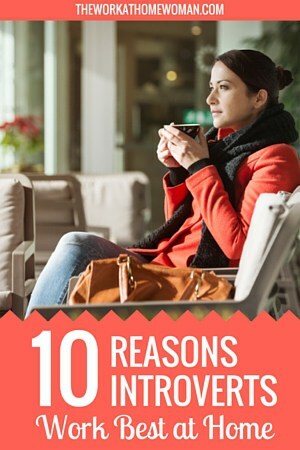 One of the most gracious benefits about working from home is that we don’t have to talk to many people at all! There is practically zero forced interaction with people (other than family members) when introverts work from home. Introverts tend to rely on themselves more than other people. They are very independent in their personal and professional lives, which can make working from home an ideal location. There is no need to depend on another person for constant direction or to monitor their every move. Independence is both a characteristic and a benefit of a work-at-home introvert. Working from home is a great option for introverts due to their self-sufficiency. They are independent workers and utilize resources that are often overlooked while in a traditional work setting. Many answers can be researched individually, instead of asking a fellow co-worker or supervisor. Introverts have a knack for thinking of the solution first, rather than relying on someone else to give them the answer automatically. Introverts tend to be very observant, even with things that are not visible to the eye. They take in their whole surroundings and can easily adapt to its needs. This can be problematic if an introvert is stuck in a busy office. Instead of focusing on the task or tasks that need to be tended to, they may become distracted by their other co-worker's problems, making it especially hard to complete their duties on time. When an introvert sets a goal, it is most likely going to be reached within a reasonable amount of time. Supervisors can rest easy when they have hired an introvert to work at home because, well, introverts need less supervising. Since introverts are most comfortable working in a secluded location, they also can reap the benefits of being more organized and punctual. Public places, including traditional jobs outside of the home, can be jam-packed with distractions. This can easily cause unnecessary anxiety in a sensitive introvert. Frequent distractions or interruptions can make it almost impossible for an introvert to complete a task. When working from home, these annoyances can be easily controlled or eliminated, which can help them focus clearly on the job at hand. An important concept for introverts to practice is that of grounding, which is a natural approach to reducing stress and releasing built-up energy that has accumulated in our bodies. Grounding can help people declutter the mind, which also provides mental clarity. Introverts can accomplish this much easier at home because of the convenience of being able to escape when necessary, even if it's for only a few minutes at a time. It can be quite challenging to break free from traditional office rhetoric when you feel the need to unwind, even if it is only a few minutes. Many introverts are creative in nature. When you add up all of the benefits that an introvert can gain from by working from home, you can provide an environment for the introvert to excel in creativity. Traditional jobs tend to absorb the possibility of showcasing an introvert's creative side. This can create a very unfulfilled and unmotivated employee. Yes, yes, yes to all of them! I spent a year working in an open office and never again! It drove me mental having to deal with co-workers who suddenly decided it was time for music or who were play-fighting down the corridor. No, I’ll choose home sweet home office anytime, all cocooned in my little room, plodding along, getting the job done.